You are now looking at one of the world’s premier collections of vinyl flooring, made by one of the world’s leading flooring manufacturers. What does that mean to you? In a word, confidence. When you look at a Tarkett Vinyl Floor you know that you will find a design to match all of the most popular trends of home decor. You’ll get the highest level of craftsmanship and durability for your money. 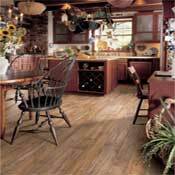 No vinyl flooring is easier to care for. You’re protected by strong warranties and excellent customer support. Tarkett sheet flooring provides hundreds of styling and color choices, easy to care for maintenance, moisture resistance, overall good durability and economical value. 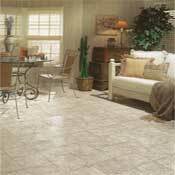 Tarkett Sheet Vinyl Floors are designed to complement today's most prevalent decor trends. Their collections provide you with a multitude of choices in regards to patterns, colors, textures and gloss levels. Their TruTex Innovative Surfacing and Nature's Touch finish capture the realistic look and feel of quarry stone, glazed ceramics, tumbled marbles, granite and many more of nature's most sought after surfaces. Cleaning and maintenance is easy with Tarkett Sheet Vinyl Floors. Just a simple sweep and damp mopping is all that is generally necessary to keep your floors looking new. The Tarkett Guardian Protection System provides an enhanced wearlayer, while offering exceptional resistance to rips, tears, gouges and indentations. Beautiful flooring deserves a warranty that is just as attractive. 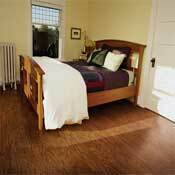 Tarkett Sheet Vinyl floors are backed with lengthy and comprehensive warranty protection. 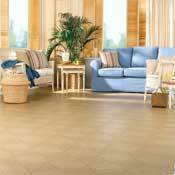 In recent years, breakthroughs in vinyl flooring technology have dramatically improved resistance to all types of common household abuse,as well as the floor’s ability to replicate the look of real wood, stone and ceramic; Tarkett has been one of the industry's leaders with many of these innovations. TruTex is a manufacturing technique that almost perfectly duplicates the look and texture of real slate, wood and ceramic tile. 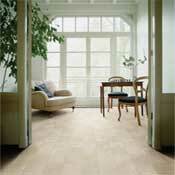 Try putting a sample floor featuring TruTex at your feet and see if you can tell the difference. Nature’s Touch is another breakthrough in surface texture realism. It not only helps floors look more real, it also helps them feel that way by replicating the textures of real stone, wood and tile. Looking for extra toughness? 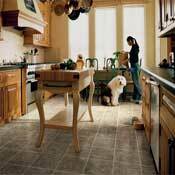 Look for a floor featuring the Tarkett Guardian Protection System. When you see this symbol, you can count on excellent resistance to scuffs, scratches and stains, as well as indentations, rips, tears and gouges. WearGuard is a feature found only on the Infinity floors. It means even additional protection for the surface or your floor and a lifetime warranty against wear and manufacturing defects.